Powers/Abilities: Like all gargoyles his strength is superhuman. He has wings that allow him glide, not fly on the wind. During the day, he, like all gargoyles, turns to stone. This allows him to heal faster then humans. Also, he does not age during while he "sleeps." However, he is vulnerable during the day. Unlike most of the Gargoyles he has adapted better to twentieth century technology and is quite skilled at hacking computers. History: Lexington was born at Castle Wyvern during the tenth century, along side Brooklyn and Broadway. They were not called this then since traditionally gargoyles do not have names. They became fast friends spending most of their time together. Eventually, Vikings attacked Castle Wyvern. Human refugees fled to the castle for protection. A quarrel erupted between a group of refugees and the trio. Though the relatively innocent party, Goliath, the clan's leader, chastised them and for punishment had them sent down to the rookery where gargoyle eggs were hatched. It was this that saved their lives when the castle was ransacked the next day. Of the gargoyles at Castle Wyvern that day, only they and the eggs where spared. They did, however, meet up with Goliath, Hudson, and Bronx, who had chased after the Vikings and thus were not in the castle after the attack. Together they pursued the Vikings to free the human captives who had been taken during the raid, and to avenge the slain. During the resulting battle, a captured sorcerer blamed them for the fall of the castle and placed a spell on them. The spell could not be broken until Castle Wyvern rose above the clouds. The Gargoyles slept for centuries until the near the end of the twentieth century, when billionaire David Xanatos bought the Castle and had it shipped stone-by-stone to New York. There he had it reassembled atop his private skyscraper, thus fulfilling the requirements for breaking the spell. Awoken for the first time in nearly a thousand years, it was soon after that the Gargoyles decided to take names from their surroundings. The clan was also tricked by Xanatos into stealing valuable computer disks. 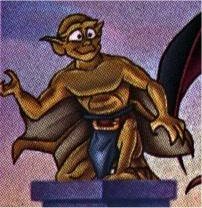 Realizing that he could not fool the gargoyles forever, Xanatos attacked them. In the resulting battle, however, he was defeated and the gargoyles claimed the castle, for a short time anyway. Comments: Voiced by Thom Adcox-Hernandez. Profile by Matthew A. Ilseman. He notes "This covers about the first six episodes. More information about the series can be found at www.gargoyles-fans.org."